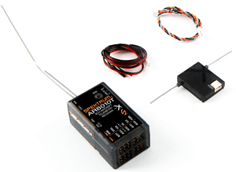 Included with this Spektrum™ DX8 G2 transmitter is the class-leading AR8010T 8-channel DSMX® receiver with integrated telemetry. Surprisingly compact and lightweight, the AR8010T provides vital flight-log data and receiver battery voltage telemetry right out of the box. Plus, an array of built-in telemetry ports makes adding, even more, telemetry data to your system easy. You'll find it compatible with a wide assortment of available Spektrum sensors such as those for flight-battery current, GPS, airspeed and much more. The AR8010T receiver also features an integrated bind-button making the need for a bind plug obsolete and the binding process simpler than ever.